President Michael Sata has threatened to dissolve parliament and call for fresh elections if the opposition continue defeating government motions in parliament. Sata said if the opposition will again reject the names of individuals the PF government has presented to sit on the Public Accounts Committee (PAC), he will dissolve parliament. Sata accused the MMD and UPND of ganging up to frustrate PF and to resist the lifting of former president Rupiah Banda’s immunity. He explained that the opposition MPs had given his government a first vote of no confidence by shooting down the motion for the constitution of the Parliamentary Accounts Committee (PAC) stating that his government would not hesitate to dissolve parliament if the MPs continue voting against progressive bills. Mr. Sata wondered how the opposition Movement for Multi Party Democracy (MMD) and United Party for National Development (UPND) voted against the bill that when most of the proposed names of the committee members were from the opposition. “How do opposition MPs vote against the motion to constitute members of the Parliamentary Accounts Committee (PAC) when the committee was dominated by themselves with only one MP from the Patriotic Front,” he asked. He charged that the opposition MPs voted against the motion because they wanted to protect the removal of immunity of former President Rupiah Banda. He has however explained that that his government is not in a hurry to remove the immunity of the former Republican President Rupiah Banda. 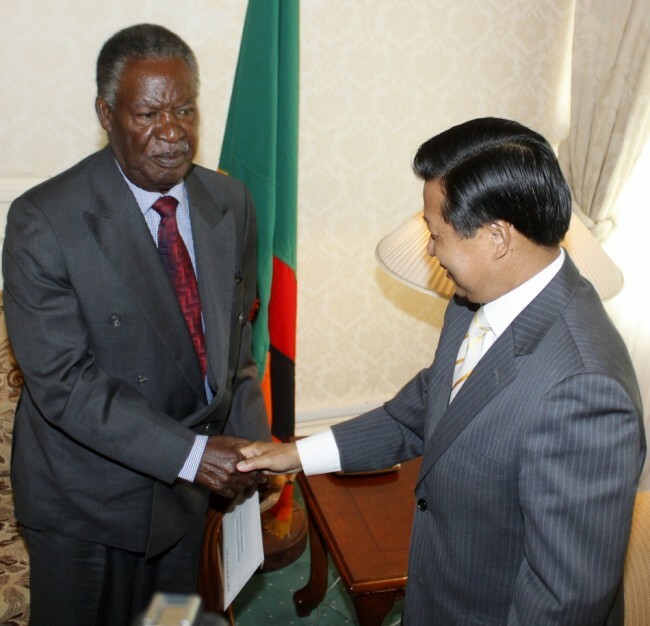 Mr. Sata said this when he swore in Secretary to the Treasurer, Fredson Yamba, Copperbelt Province Permanent Secretary (PS) Christopher Mutembo and Permanent Secretary in Charge of Administration in the Office of the Vice President Annie Sinyangwe at State House Thursday. On Wednesday, government lost its bid to have Parliament adopt a nine-member committee of the Public Accounts Committee (PAC) for the first session of the 11th National Assembly after the motion was subjected to a vote by division. The opposition garnered 61 votes against Government’s 60. The members of Parliament (MPs) whom Finance and National Planning Minister Alexander Chikwanda proposed to be members of the committee were Chipangali MP Vincent Mwale (MMD), Christopher Mulenga of the Patriotic Front (PF), Mulumelume Imenda of the Alliance for Democracy and Development (ADD), Patrick Mucheleka (Independent), Chifita Matafwali (PF) and Highvie Hamududu of the United Party for National Development (UPND). Others were Gabriel Namulambe (MMD), Mwansa Mbulakulima (MMD) and Austin Milambo (UPND). Leader of the opposition in the House, Felix Mutati in his debate said as much as the opposition was not against the names, it still felt uncomfortable to endorse them as the Government had not categorically stated the fate for the position of secretary to the Treasury. Presenting the motion, Mr Chikwanda said PAC conducted a critical role in the usage of public funds and therefore called on MPs to support the members proposed for the committee. He said PF was serious about the fight against corruption and would ensure that reports produced by the Auditor General’s office were dealt with and culprits brought to book unlike what used to happen in the past. The minister said it was therefore cardinal that Parliament approved the committee so that the fight against corruption could be stepped up through its oversight role. However, leader of the opposition in the House, Felix Mutati in his debate said as much as the opposition was not against the names, it still felt uncomfortable to endorse them as the Government had not categorically stated the fate for the position of secretary to the Treasury. Mr Mutati argued that as far as the opposition was concerned, the Government had not stated if the position of secretary to the Treasury was still in existence or not, and that if it still existed, the bearer was supposed to be sworn in publicly. “The coordinating ministry, which was the ministry of Finance, should put its house in order and one key position was that of secretary to the Treasury. “That position is key to PAC. Under the Public Finance Act, the secretary to the Treasury appoints other office holders but under the current state the whole system is distorted,” Mr Mutati said. He said the opposition would not have problems endorsing the names of the selected members for as long as the anomalies were rectified. “Speed is important but order is crucial and we have no choice but to have the position of secretary to the Treasury,” Mr Mutati said. In winding down the debate, Mr Chikwanda admitted that there was an oversight but stressed that the permanent secretary appointed was ably handling the affairs of the ministry as well as the roles of the secretary to the Treasury.